Traumatic brain injury (TBI) is very common; in fact, in all likelihood you have experienced one yourself at some point in your life. Fortunately, the vast majority of injuries (over three quarters of cases) are on the mild end of the spectrum . However, those patients who unfortunately sustain a more significant head injury need to be discussed with neurosurgery. 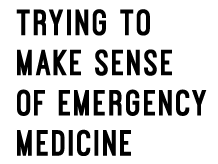 The aim of this blog post is not to go over the emergency management of TBI, but to give you a framework for referring the patient to neurosurgery. At its core, the ATLS framework forms the basis of any trauma referral you make and a severe head injury is no different. There has been some recent controversy surrounding ATLS with certain factions of the EM community viewing it as too rigid and slow on updating its protocol with the latest evidence. If you are still early in your training, I would be aware of the limitations of ATLS but keep it as the framework you work off as it is the international standard. Saying that, when you come to refer patients, regurgitating all your ATLS findings/management is not the most efficient way to communicate. Neurosurgeons like to get to the point – therefore knowing the most pertinent pieces of information to convey to them is key and will make for slicker and more expedited care. As always, open your referral with the patient’s details including age, gender and their hospital number. Then drop the headline TBI subtype diagnosis. 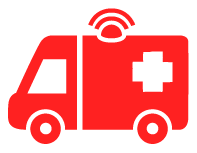 This early warning shot lets the doctor on the other end of the phone know the urgency of the referral immediately. A brief overview of the mechanism is very important. It should include a brief description of how the patient was injured, if they had any intoxicants on board and the context in which they were found. It’s particularly important to include these details when describing high impact mechanisms (such as a high speed car or motorbike accident) or penetrating injuries (such as bullet or stab wounds to the head). The pupils are a very important clinical predictor of outcome in TBI. The main findings neurosurgeons are interested in are pupil size and light response. We are particularly interested about whether pupils are asymmetrical and when one or both pupils lose light response. A chronological description of any changes is important when referring a patient. One important point to raise is that of fixed dilated pupils – traditionally this is deemed to be a poor prognostic sign. However, don’t write these patients off! It is vital to appreciate that the TBI subtype significantly affects the outcome in the context of fixed dilated pupils – Extradural haematomas have far better outcomes than subdural haematomas . Pay close attention to the scan. The Glasgow Coma Scale (GCS) is extremely important and should take a central place in your referral. It is a strong predictor of patient outcome after TBI. When making your referral it is important to build a temporal picture as a patient’s conscious level is fluid and can change over time. From a neurosurgical perspective, it is vital to get an idea of the changes over time. The motor response is the strongest predictor of outcome and you should take particular care when assessing it. It is always important to breakdown the GCS when referring patients. Using the aggregate score alone means nothing without its components. Always include other important findings during your referral. That includes their other neurological findings. Patients with severe head injuries will have disordered consciousness so it is difficult to do a full neurological examination. However, a screen of motor power is useful to convey to the neurosurgical team so they are aware of pre-operative function. It is also important to discuss other injuries – particularly, neurosurgeons are interested in whether the c-spine has been cleared. There are a number of rules that can be used to guide clearing the c-spine such the Canadian and Nexus c-spine rules. These algorithms will always point towards the need for radiological clearing of the c-spine in the context of a severe TBI (either due to the mechanism or altered consciousness level) – so always remember to arrange a c-spine CT along with your CT head to check for fractures. It is always important to advise on important past medical and drug histories. I would include a quick summary of the patient’s important comorbidities. It is crucial that you tell neurosurgeons if the patient is on any anticoagulant/antiplatelet drugs – this is important for operative planning as we may need to reverse drugs like warfarin or give the patient platelets if they are on aspirin. 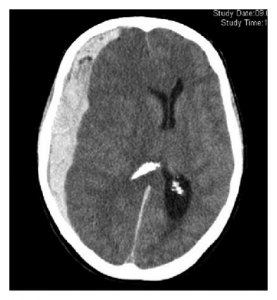 Though the radiology of TBI is out of the remit of this blog, I wanted to give you a few tips on describing key radiological findings in patients with extra-axial haematomas. These are collections of blood outside of the brain and include subdural and extradural haematoma. Subdurals are far more common and tend to have a worse outcome that extradural. 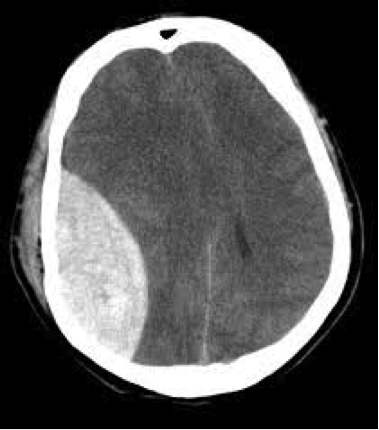 Both forms of bleed appear white (hyperdense) on CT and the best way to differentiate them is on their appearance: subdural are concave and extradural are convex. Neurosurgeons tend to be interested in two main findings when referred these pathologies: the maximum depth of the clot and amount of midline shift. Of course no medical blog would be complete without a mnemonic. Here is one I’ve come up with to help you remember this framework for referring a TBI. 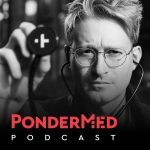 Do Medics Prefer Gambling On Poker or Roulette? By following this basic structure, you should be able to tease out the most important pieces of information, and present quickly and coherently. No doubt this will impress the neurosurgeon on the other end of the phone! 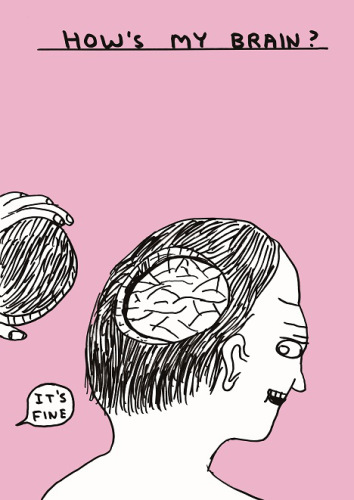 David Shringley is the artist of the ‘how’s my brain?’ image at the top of the post. Mr. Aimun Jamjoom (@aabjamjoom) is a neurosurgical registrar in Edinburgh. He has taken a break from his surgical training to study traumatized mouse brains. In his free time, he chairs the British Neurosurgical Trainee Research Collaborative (@bntrc), reads excessively about politics and writes the occasional short story.